We are in a mission to provide superior utilities and software for data back up, data management. By virtue of years of operation experience, together with deep knowledge of the changing market demands, we have moved forward into the sphere of Mobile solutions, and in so doing now offer a complete set of solutions for our clients. We aim to convey our unwavering mission to help every user-even the least tech-savvy-to freely handle hassles. With this in mind, every product is developed under the principles of ease-of-use and high-practicality. MobiSecret is one extraordinary software to keep your family safe and far from the potential threats. By MobiSecret, you can easily scan and extract the data stored in the iPhone, iPad and iPod. It provides users with whole contact history in the iOS devices, including call history, messages, time and duration and WhatsApp messages. The software is entirely virus free and easy for everyone to use. This is a legal agreement between you (either an individual or an entity) and MobiSecret. This Agreement supersedes any prior version license and governs your use of the software. 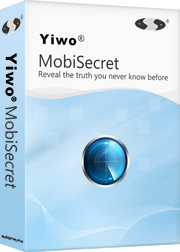 Anyone may download and use the trial version of MobiSecret. Once registered, the user is granted an exclusive license to use. MobiSecret on one computer, for any legal purpose, at a time. You need a license for a machine on which the program is installed. The registered MobiSecret software may not be rented or leased but can be permanently transferred, if the person who receiving it agrees to the terms of this license. If the software is updated, the transfer must include the update and all previous versions. MobiSecret IS DISTRIBUTED "AS IS". NO WARRANTY OF ANY KIND IS EXPRESSED OR IMPLIED. YOU USE AT YOUR OWN RISK. THE AUTHOR WILL NOT BE LIABLE FOR DATA LOSS, DAMAGES, LOSS OF PROFITS OR ANY OTHER KIND OF LOSS WHILE USING OR MISUSING THIS SOFTWARE. Copyright © 2013-2014 Yiwo . All Rights Reserved.